You can create a template using the Timeline view. NOTEIf you are creating a template from a character rig master template, you should collapse everything inside a master peg and put a keyframe on the first frame before creating the template. In the Timeline view, select some cells or layers. You can create a template from a whole hierarchy of layers by collapsing the hierarchy and selecting its root layer. This can be useful for creating templates based on character rigs or scene backgrounds. In the Library view, select a folder to store the template. 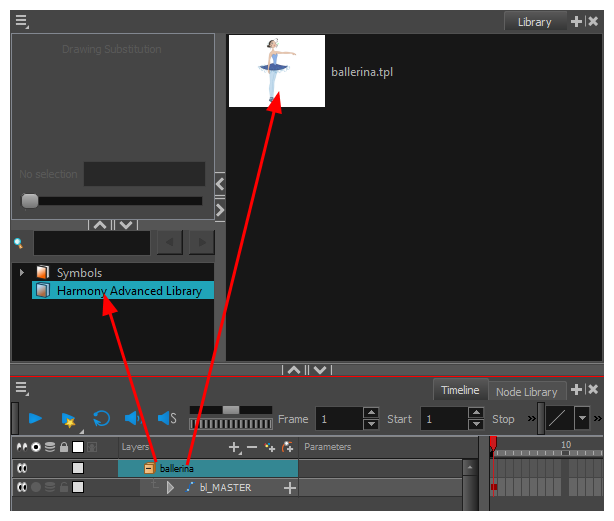 By default, you will have a library named Harmony Advanced Library , which is stored on your computer, in the Toon Boom Harmony Advanced Library subfolder of your Documents folder. If the library folder is locked , right-click and select Right to Modify. Drag the selection to the chosen library folder. In the Rename dialog box, give the new template a name.